Sport jacket, blazers for men, leather jackets for men, western sport coat, tweed sport coat and ​mens sport coats for casual and dress wear. You will see a variety of sport jackets in different styles and fabric types. 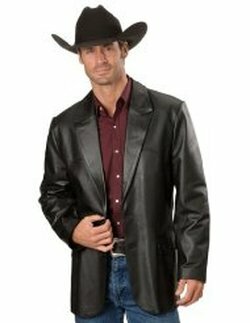 There are classic and western style jackets in a wide range of sizes. All of these have great reviews from previous customers. I do advise that you have a look at those for any additional comments as to the fit of the jacket. Most of the time I see that they are all standard size with a few exceptions that may run a little larger or smaller. See how good wearing a sport coat with jeans can look. I chose to show this jacket in black, but it comes in 2 other colors. It is a classic style with two button front closure. There is a chest pocket and 3 flap pockets on the outside and interior pockets also. It has a polyester lining. 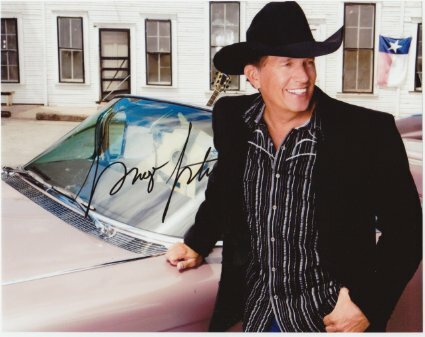 If you prefer western styling, this leather jacket has single point yokes on the front and back. The lower front flap pockets also have a single point yoke. It is lined and has two buttons in the front for closures. This jacket comes in other colors and is available in regular and tall sizes. ​This is a 3 button distressed leather blazer that has pockets inside and out. There are buttons on the cuff also. Scully's distressed lambskin leather blazer has western yokes on the front and back. It has two button front closure and notched lapels. 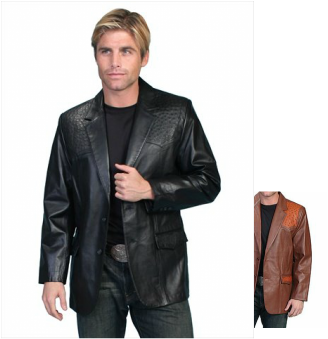 Here is a leather jacket with ostrich trim at the top and on the pocket flaps. It comes in three different colors including the cognac color in the smaller picture. It is also available in black with black ostrich trim and a buttercup colored trim. 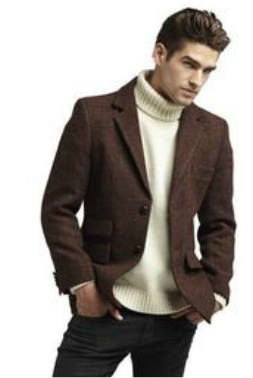 Harris Tweed jackets are made in England. This style has slanted pockets and leather buttons. It is lined and comes in heather grey or brown tweed. A classic tweed sport coat will look good with jeans or slacks. There is just something about tweed that makes it easy to coordinate with with different color pants. This one has western style yokes on front and back. 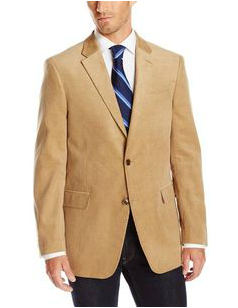 This is a 100% cotton corduroy blazer with 2 buttons in front and buttons on the cuffs. It features notch lapels, welted chest pocket and side flap pockets. Put this on with your jeans and go to town. 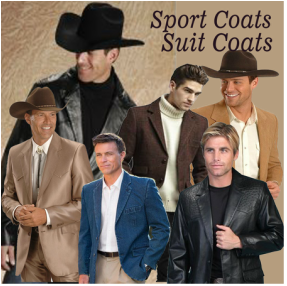 These coats have suede elbow patches and western styling. There are yokes on the front and back of this coat. It is made of 100% cotton and comes in 4 colors. This coat is titled as big/tall but it is available in regular, short and tall fit up to size 54. Norm Thompson's denim sport coat is 100% cotton with a soft broken in feel. It is lined and has 3 inside and 3 outside pockets. If you like the retro western look with embroidery and piping on your jacket, check out these from Scully. They come in regular, long and tall sizes. This style is also available with different color embroidery. Suede jackets in this style from BGSD come in 2 colors and sizes to fit up to 2 X Tall. This style has two buttons in the front. The front of the jacket has a chest pocket and convertible flap pockets. There are pockets on the inside of the jacket also. Get the look of leather with microsuede. This is a fully lined coat with stitch detailing at the yoke on the front and back. It is available in 4 colors and comes in regular and long sizes up to 52. 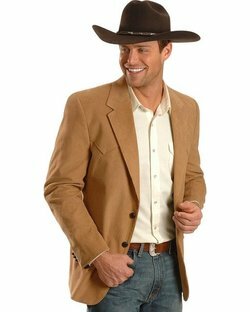 ​ Western style suit coats can be worn with jeans or slacks to fit the occasion. 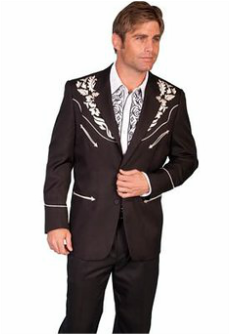 For western wedding, you can bypass the tux rental and have a jacket that you can wear again for other special events. Circle S has very nice looking men's suit coats. These can still be worn with jeans, but for the dressiest occasions, they can be paired with matching slacks from Circle S.
This Boise western suit coat has suede-look front and back yokes and drop arrow detailing. What a handsome alternative to black! I love this color. Circle S has slacks that match their jackets if you want a complete suit. 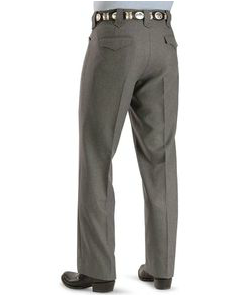 These slacks come in several colors in sizes 30 through 50. They have western cut pockets in the front and peaked back pocket flaps. This particular style has some stretch for additional comfort and they are boot cut so they will fit over your boots easily.